Thirty biblical meditations inviting women to see how God is caring for them, growing them, and even using them, in times of suffering. Hurt is real. But so is hope. Kristen and Sarah have walked through, and are walking in, difficult times. So these thirty biblical reflections are full of realism about the hurts of life—yet overwhelmingly full of hope about the God who gives life. This book will gently encourage and greatly help any woman who is struggling with suffering—whether physical, emotional or psychological, and whether for a season or for longer. It is a book to buy for yourself, or to buy for a member of your church or friend. For anyone who is hurting, this book will give hope, not just for life beyond the suffering, but for life in the suffering. Each chapter contains a biblical reflection, with questions and prayers, and a space for journaling. 5.1" x 7.8" x 1"
I had not finished reading the introduction to this book before I was making a mental list of friends that I knew would find it a balm to their weary hearts. Kristen and Sarah minister to fellow travelers on the road of suffering, out of the resources they have received on their own journey, from the God of all comfort, grace, and hope. Kristen and Sarah have let us in to listen to their meditations in the midst of pain and limitation. They've opened up their hearts, their stories, and their Word-filled words. From our various contexts, we will all learn as we listen. I'm grateful for this book's faithful call to lift up our eyes to a God of mercy who loves and saves. This is a wonderful, vulnerable and honest book, and I highly recommend it to anyone who needs the good news of Jesus in a difficult time. Kristen and Sarah have suffered immensely, but both of them know that our only hope is found in Jesus. In Hope When It Hurts, they have labored to encourage our souls with the gospel, give us space to grieve our loss, and turn to the only source of real hope. I'm praying God uses this book in extraordinary ways! "So many words to encourage my aching heart"
I wish I could give this book 10 stars. I I cannot even begin to tell you how helpful and encouraging this book has been for me. If you’re hurting or suffering in any way or are walking through something painful with someone you love, I highly recommend this book. It was, and still is, like a soothing balm to an aching heart. 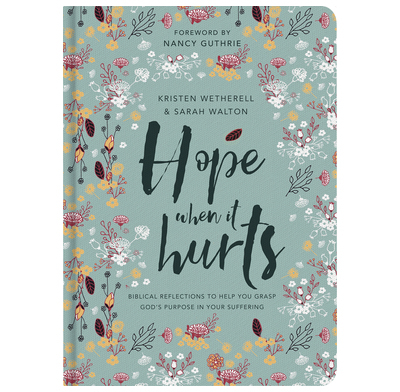 Sarah and Kristen point to Jesus and the gospel over and over and over as they share honestly about their own struggles with suffering. This book truly is chock full of HOPE for those who are hurting. Apart from the Bible, it has been the most helpful book I’ve read on suffering. This book is liquid gold. There are no sufficient words really that better describe it except to say that, importantly, it is theologically astute and the application of the bible to our situation of suffering and hurt is balm for a weary soul. I will be forever grateful and could not recommend this highly enough. I got this book as something that I could use as a devotional and it was worth every penny. Regardless of where you're at there is so much to learn from this book. The journal section at the end of each chapter, along with the reflect section help to sum up what you have learned. I couldn't recommend this book enough! A beautifully presented hardback book, though the flowery exterior might put men off from reading it! That would be a shame as all could benefit from the biblical truths shared and applied in these pages. It's not a book to hurry through but to read a chapter at a time, praying for the Spirit to apply the truths of God's Word to yourself and taking time to meditate on them. There is space for writing your own reflections, which is great. If you are feeling particularly low and negative about everything when you're reading,as I sometimes was, I'd recommend revisiting it when you are more able to benefit from its wisdom. A lovely book to give to others, though a less flowery cover might be better for the men! Both authors really know what it is to suffer, and also know their Bibles well. That makes this book an invaluable resource for those who are going through suffering. The trials are deep and real, but so is the consolation and encouragement obtained from the Bible. Utterly realistic but also faithful to God's word. Strongly recommended! This is an amazing book! I am suffering the loss of my beloved mother. This resource has become invaluable to me. I found the authors’ application of Biblical truths in their personal struggles a balm for my own soul. It helped me to focus my eyes on the only one who can heal my sorrows- Jesus! I thank my sisters in Christ, Kristen and Sarah, for sharing their pain so openly and honestly. You are helping countess others to carry their burdens with Resurrection hope! God bless you!! I have chronic migraines and spend most of my time in bed because of them. I really and truly felt that I was useless and God could never use me for anything. After reading this, knowing it came from someone else with chronic pain help me get through each and every day. Each day got better and better! I would recommend this to anyone, especially someone going through a hard time. I don't usually write book reviews but when I was offered the chance to read this book I jumped at it as the title intrigued me. This book has helped me to realised the effect that hurts have had on my relationship with God. Even though it has been nearly 10 years since I went through a period of hurt and pain I am still carrying around the effects. This book has helped me to see the barriers I have placed around myself to protect myself from being hurt and disappointed again and as a result the barriers that I have put up between myself and God. The book has helped me to understand that God does love me and he is looking out for me and caring for me. When we go through periods of hurt it is not because God does not love us but because He loves us. I would recommend this book to anyone who is going through a tough time as it really helps to strengthen and uplift you. The book unpicks key bible passages around hurts and has small bite sized chapters you can work through each day or in one go depending on your reading style. I was given a free book in order to review this product but this has in no way influenced my review of the product. All opinions are honest and are my own.